But there’s a few problems. Whilst bike infrastructure is slowly improving, it’s still quite likely that your workplace has nowhere to park your bike and lacks showers. Maybe there’s a nasty and unavoidable stretch of road on the way to work and maybe the shop/theatre/restaurant you want to get to after work is waaaay down on the other side of town and a good few kilometres from the nearest train station. Australian cities are nowhere near Velotopia, that’s for sure. If only you could combine your bike rides with a few segments of public transportation. Enter the Brompton. These little fellows came into production in the 1970s in London England where they’re proudly still made today. As far as folding bikes go, these are pretty well the top of the line. They fold and unfold quickly and smoothly, ride brilliantly and enjoy an enthusiastic world-wide following as a stylish city bike ridden in whatever you normally wear when you’re not riding. There’s even world wide Brompton races to test your speed, dress sense, folding skills and silliness. There’s oodles of after market accessories available for customisation with leather seats, grips and carry handles being amongst the most popular. The bike itself isn’t particularly cheap to buy in the first instance at around $AUD2500.00 depending on the options you go with but from there consumable parts like brake pads, chains and tyres are cheap and because they’re quite a simple steel machine, they are easy to work on. So, whilst bringing a full sized bike on a Qld Railways train is problematic at certain times of the day and completely out of the question on a Brisbane City Council bus, a Brompton with it’s minuscule 16 inch wheels folds down to about the size of a large brief case and allows you to travel on both types of services without so much as raising an eyebrow. 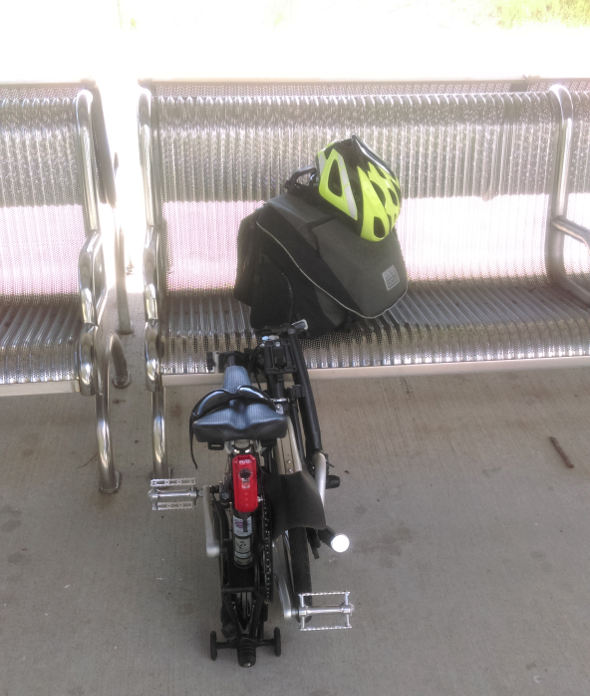 Parking your Brompton is not a problem in even the smallest office because it simply folds down and hides under your desk like George Costanza taking a nap. In fact, you can put it in pretty well any nook or cranny – in a cupboard, behind a door, under a staircase. The possibilities are endless. Showers likely won’t be necessary because you’re combining your journey with a bus or train trip and thus only cycling a short distance so a couple of dampened face cloths and a change of shirt should be the most that’s needed even in the summer time. Of course on the way home, you can fly like the wind and even skip the public transport altogether because despite it’s tiny wheels and collapsible frame, the Brompton is quite comfortable on a longer journey too. The little folder also fits in very nicely with your after work frivolities such as Christmas parties and conferences. On countless occasions, mine has been locked outside the Charming Squire at South Brisbane, in the cloak room of the Convention Centre while I attended a conference, folded up in the corner of a restaurant in Park Road at Milton plus various other outings to pool halls, bars, bowls clubs and even job interviews (yes, I got the jobs I went for). As at this writing, I’ve been commuting daily on my Brompton for four years and I can say that it’s not only the best bike I’ve ever bought, it’s the best thing I’ve ever bought. That’s a big call but I’d have to say it’s one that’s fully justified. There are various handlebar and gearing options available depending on how upright you like to sit and how much of a gear range you need. I went with a medium upright position and three speed Sturmey Archer hub which has proven very adequate for riding around Brisbane. If you have some time to kill, swing past Epic Cycles at Paddington – the good folks there will help you make up your mind. 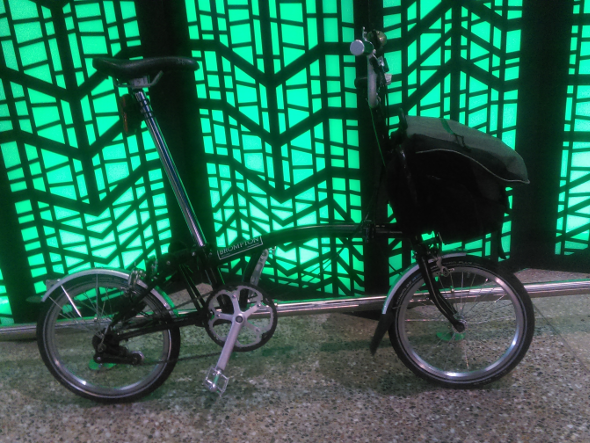 Lastly, if you still need convincing that riding a Brompton is not only practical but also cooler than a room full of Nick Cave clones, feast your eyes on the Dahon Diaries – a travel photo diary of a folding bike enthusiast with his (at the time) fifteen year old son doing the photography. It’s a few years old now but still brilliant. …I can definitely see Nick Cave riding one of these babies.